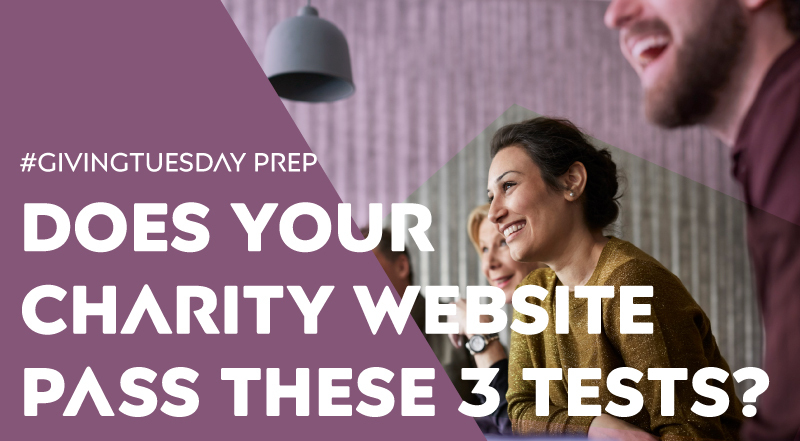 #GivingTuesday Prep: Does Your Charity Website Pass These 3 Tests? I know how much of a pain your website can be at times. It can be tough to update and manage. It can be even tougher to keep up with the lingo, best practices, and tech-talk – especially when there are so many other things to do. Well – now’s your time to shine. I’m going to share secrets the pros use when building a great website – no tech-talk needed. With these 3 simple tests, you can ensure your charity website performs well all year round, and especially on Giving Tuesday. 1. The 8-Second Test: Can Your Visitors Tell What Your Charity Does? Internet users have a very short attention span. That’s why it’s so important that you make sure your website’s landing page tells your story clearly and quickly. If they feel they’ve landed on the wrong site, or that the content on the page is not relevant to them, they’ll leave immediately. You’ve got about eight seconds to explain to your visitor exactly what your charity does before they leave your site. Some studies show that your first-impression window can be as quick as 5 to 6 seconds. How does your website stack up? Ask a friend or someone outside your organization to take a look at your website. After eight seconds, turn off the screen. Ask them to explain what your charity does. There are a couple things you can do to improve how well you communicate your mission on your home page. If a website visitor left your site knowing just one thing about your charity, what would it be? That’s what your landing page should say. Keep your language short and simple. “We help x do y.” Don’t get into the details on your landing page. Saying too much usually only adds more confusion than clarity. An image says a thousand words. If you don’t have original photos that look good online, try using a free high-quality image libraries like unsplash.com or pixabay.com. Want to know what your website visitors really think? Try installing an app that records how visitors are using your site. Some apps will even show you a heat-map of what specific page elements your visitors are paying attention to. My favorite apps are HotJar and FullStory. 2. The Blur Test: How Clear Is Your ‘Donate’ Button? The clearer your ‘Donate’ button is, the more likely it is that people will convert. How can you be sure your ‘Donate’ button is clear to everyone? The blur test. The blur test is a popular technique web designers use to determine how easy it is to see important elements of a website. In your case, that’s the ‘Donate’ button. Here’s how it works: Look at your website. Then, squint your eyes (or in my case, take off your glasses). You should see a blurry image of your website. If your ‘Give’ button is implemented correctly, it should still jump out even when your page is difficult to view. In this example, you can see that once you blur your vision, most of the elements on the page blend together. However, the two yellow ‘Donate’ buttons still stand out well. There’s also the ten-foot test. Instead of blurring your vision, take a couple steps back from your computer and judge how well your donate button appears. Making sure your site passes the blur test in time for Giving Tuesday. Use red, orange or yellow for your ‘Donate’ button. Those colors are high-converting, attention-grabbing colors and jump out well in a blur test. Tinker with the size of the button. Make sure it’s at least 10-20% bigger or bolder than the rest of your content. Don’t be afraid of white space! Ensure there is plenty of white space or margin around your button so that it doesn’t get lost in your page design and content. Great use of white space (or negative space) helps draw focus. 3. The Site-Speed Test: Is Your Site Loading Well On All Devices? Many organizations focus so much on creating a great website but neglect to realize how long it takes for their website to load all those videos and high-quality content. Why does your load time matter? Remember test number one? You only have roughly eight seconds to share your story. If your page takes eight seconds to load, it is very likely you’ll lose a good number of visitors. Keep in mind that some of your donors have unreliable internet connections – spotty reception, slower 3G connections and so on. It’s important that your site loads well for devices that don’t have the best connection. There are plenty of free online tools you can use to test how well your website loads. We like Pingdom.com’s speed test tool. You enter your website address and it will rank your site’s performance. If you get a low grade, the test should show you how you can improve your site’s speed. If your page is too big, try breaking it into multiple pages. For example, if you have a full-view calendar somewhere on your homepage that might be slowing your page loading, replace it with a “View Events Calendar” button that takes you to a full-view calendar. Use a cloud service like CloudFlare to turbo charge your website’s loading. It should work with any website regardless of who built it or how it is powered. Try moving your site to a managed and hosted service where many of these loading, speed and security details are already taken care of for you. GiveCloud is an optimized website builder just for charities with all the bells and whistles you need. Best of all, GiveCloud websites seamlessly integrate with DonorPerfect Fundraising Software. Learn more about GiveCloud. Josh Bloomfield is a self-taught programmer turned entrepreneur. After helping found multiple enterprise-level software companies, he used his passion and expertise to help nonprofits all over the world. He’s now the founder at GiveCloud.co – a tool where charities can build their brand and do all their fundraising in one place so they can spend more time and money on their mission, and less on administration. Josh lives in Ottawa, Canada with Chelsea, his wife of 12 years, and two beautiful daughters, Poppy and Pennylane. September 19th, 2018 September 19, 2018 #GivingTuesday Prep: Does Your Charity Website Pass These 3 Tests?